J Art and Clay provide fun and educational activities based on our products to help Children develop art creativity, imagination, and motor skill. We teach children through variety of different media from The world's softest air dry clay, stain glass gel and glass crayon. J Art & Clay offers a wide range of programs to fit every situation. While the possibilities are endless, we've developed several themed workshops to help get you started. Most workshops are one hour of step-by-step modelling or painting with instruction and assistance from our trained instructors. While our workshops provide structured content there is lots of room for creativity as each craft ends up being unique and we encourage everyone to make it their own. Workshops are typically one fun-filled hour led by trained instructors. All materials are included. Children can simply take home their artwork that very day. Themes change monthly and vary depending on seasons and holidays. J Art & Clay provides classroom visit to various school in the city. We bring our staff and materials to the classroom to enhance their learning experience with creative fun activities. Typically an hour long with hands-on instructions with different themes tailored to their school learning. This program is a flexible education enhancement tailored to your creative child’s interests in arts and crafts. 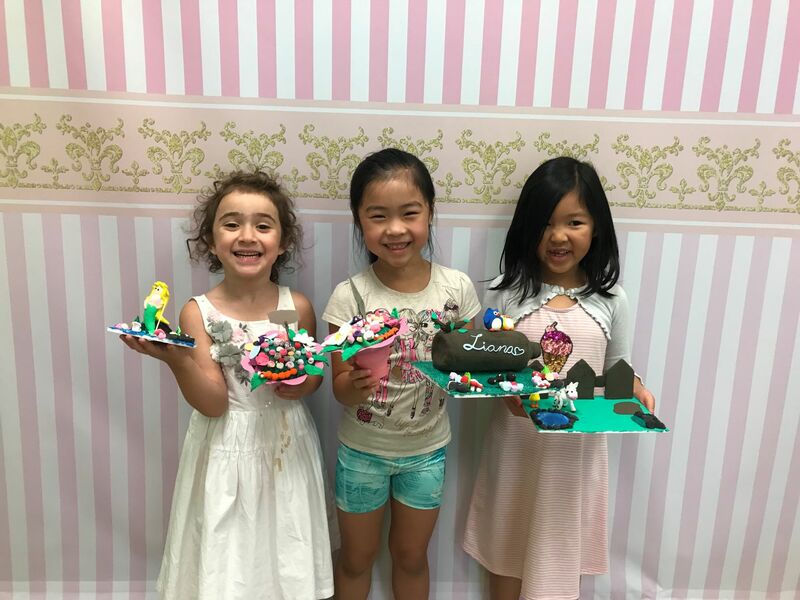 Each week your child will participate in a range of activities that increase their skill and knowledge within the arts and crafts field in a fun and exciting way. It includes all 3 of our activities with clay modelling, stain glass painting and glass crayon fun. J Art & Clay Parties Are Stress-free and Mess Free! A creative, fun, and educational way to celebrate birthdays or any kind of occasion! For children, adults, and families! J Art & Clay offers customizable parties that are stress-free and mess-free! All craft materials are included and you have your own Instructor / party host who takes care of all set up, serving & clean up. It couldn't be easier! The birthday child can select his or her own theme for the party and each guest gets to make and take home their clay creation that day! A private party room for 2 hours with approximately 1 hour and 15 mins for modeling and 45 mins for Food/Cake. Party Supplies (plates, cups, napkins, utensils). Room for parents to relax and mingle. Call to discuss if your party is over 30 kids. Give us a call or drop by to discuss our current birthday party crafts and any other ways we can make your child's birthday extra special! We provide loot bags with our own products. Kids can take home a gift that they can and know how to use after the party. From clay to glass crayon, we offer different packages for all loot bags need. Our Air Dry Clay is non-toxic, super soft and a great tool to develop fine motor skills. 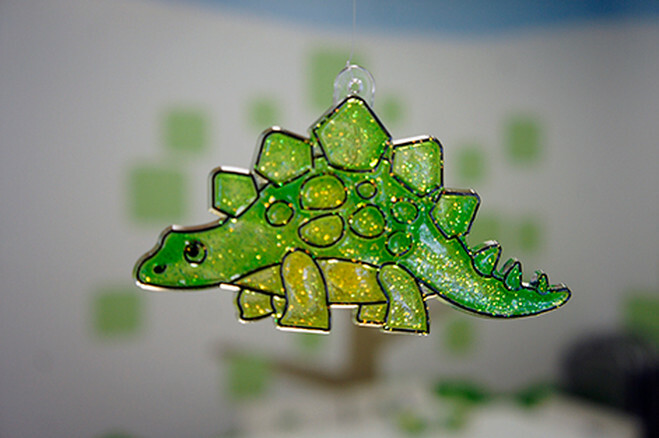 A Fun and Easy way to create stain glass by yourself with patterns or any character. 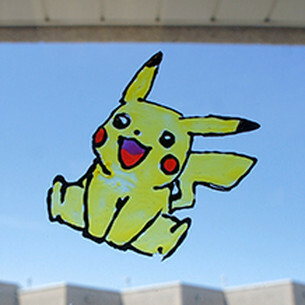 A Fun and Colourful way to decorate your window. Have Questions or Booking a Party? Ⓒ 2018 J Art & Clay Inc.